I first met Nic Hard back in 2007. During that year, I (along with the other members of the band I drum for, Glint) was working on what was going to become our second full-length album. Nic caught our eye (and ear) because of his mixing and engineering expertise that can be found on a few of the albums from world famous band, The Bravery. We cut the record in 20 days at the end of that year at The Blackberry Studios. Set on a mountaintop in Oregon, nearby Eugene, its isolated location and scenic views made everyone bring their minds to focus on the recording process. Nic ended up not only engineering the album but also took on the responsibility of mixing what we accomplished during those wintery 20 days. Forwarding to present time, Glint is again working on a new album and Mr. Hard is once again around for some engineering duties. Between late night sessions, friendly soccer games (which became a must during the World Cup) and triathlons (Nic finished the 2010 Nautica New York City Triathlon in 200th, believe it or not), I was able to sit down for a few minutes with this native of the Oceania Continent and quickly chitchat about not only the place where most recordings start but also where mine and his passions collide, drum recording. Here is what I was able to extract at the end of our conversation. It’s surely a taste of Mr. Hard’s persona. MGR: So Nic, tell me what got you into music recording and production. I had been DJing and making electronic music since I was in high school and after losing my job for a scaffolding firm I decided that I should take my love of music and knob twiddling and make a career out of it. MGR: What do you expect from a drummer when stepping in the studio? Just kidding. I expect a couple of things. The first and most important is that they be willing to change the way that they might be used to doing something. Sometimes, in order to achieve a specific sound or feeling in a song, the drums may need to be played softly or with a tea towel wrapped around the beater or one drum at a time, maybe even move the kit outside. Two things that really help a lot, but are not expected are: playing to a click and being able to tune the drum set. MGR: Are there any factors that influence you on choosing the location for tracking drums? Nic: The style of music will usually dictate the requirements for the studio. If a big rock sound is needed I will want a live room with a big sound, if it's an intimate sound, I'll want a versatile room equipped with good gear. MGR: What are your favorite microphones when recording drums? MGR: How do you often place microphones on the kit? Nic: I almost always have a close microphone on every drum, kick and snare have 2, overheads and some combination of room mics. MGR: How do you best capture the room ambience? Nic: I usually have the Royers about 15' from the kit in a xy configuration. Then, with compression, I try to bring out more ambience if the song feels like or needs it. MGR: Do you usually apply signal processing when recording? Nic: For sure! I like to be as close to the sound that I would want in the end. I think it's an old habit from the tape days. Sometimes this is not processing with EQ and compression, but treatment of the kit and room, but also performance. MGR: Favorite pre-amp, crompressor, eq and effect processor? Nic: I think if I had to pick one of each I'd say that my favorite pre-amp is a Vintech x81, about as close to a Neve as you can get without all the scratchiness from dirty vintage gear. My favorite compressor must be either an 1176 or a distressor, probably the distressor as it has a little bit more versatility, but either one are good on anything. MGR: Other pieces of gear you can’t record drums without? Nic: For me there are no must haves. I believe that with even a Mackie and a few 57s it's possible to make a great record with awesome sounding drums. I think that the right drummer is the most important thing involved in drip recording. MGR: What’s your approach on mixing? Nic: No rules, anything goes, but I do have a tendency for banging drums. Nic: Led Zeppelin of course. Beck's Sea Change. Beatles. Queens of the Stone Age Songs for the Deaf. Nic Hard's career in music began in the mid 90's while DJ'ing at clubs and house parties throughout Philadelphia and later in London. On his return to the States, his resume began to take shape as he shifted gears to focus on studio recording and mixing. 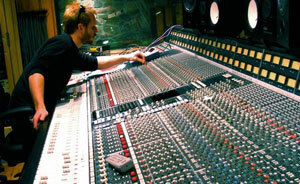 He quickly earned the position of head engineer at RPM Studios in New York City. In 2002, Nic went freelance when given the opportunity to record and co-produce The Church's record Forget Yourself in Sydney, Australia Since then, Nic has been an increasingly in-demand producer/mixer/engineer who offers versatility, respect and an edge to each of his projects. His work includes collaborations with world-renowned bands such as The Bravery (albums: The Bravery, A Tribute to the Cars, Unconditional EP, The Sun and The Moon, Stir the Blood), Aberdeen City (albums: We Learned By Watching, The Freezing Atlantic, 60 Lives EP) and The Kin (albums: Rise and Fall, The Upside) as well as up-and-coming New York City acts such as The Ropes(EPs: Cry to the Beat, Clubs in Europe Forever, Love is a Chain Store, I Miss You Being Gone), Jupiter One (albums: Countdown, B-sides) and Rudder (albums: Rudder, Matorning).